Dopaminergic neurons (DA) in vitro can produce two distinct firing patterns: single spikes, which are called slow oscillatory potentials (SOP), and square underlying bursting activity. Previously , we proposed a conductance-based computational model that explained the mechanisms of both SOP and square wave activity. Based on experimental data, the SOP mechanism was driven by a calcium (Ca) L-type current and an apamin-sensitive small conductance (SK) current. The square waves could be generated by partially blocking the SK current, but to repolarize the cell, a slow potassium current was hypothesized. Experiments on DA suggested that an ether-a-go-go potassium current could play the role of the hypothetical slow potassium current. Experiments also showed that Ca is a major player in both SOP and square wave firing. Calcium removal is an elusive mechanism and we previously considered that Ca pump is nonelectrogenic [1, 2]. However, a nonelectrogenic Ca pump leads to equal rates of Ca influx and efflux at steady state and also equal rates of charge influx and efflux. As a result, once Ca concentration equilibrates, there should be no persistent inward calcium current, which contradicts experimental observations. In this paper, we hypothesize that Ca pump contributes to cell repolarization. Experimental results already published and our numerical simulations based on electrogenic Ca pump support this hypothesis. 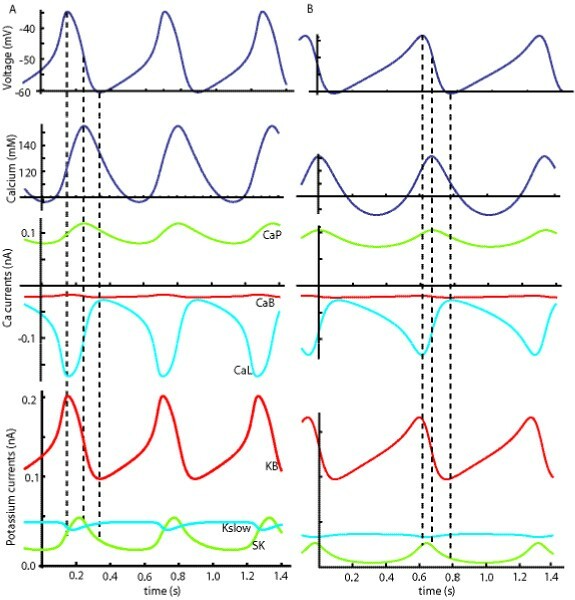 Figure 1A shows that, for SOP with nonelectrogenc Ca pump, Ca L-type current induces a strong depolarization and Ca concentration follows the rise of membrane potential. We found that an electrogenic pump did not alter significantly the depolarization mechanism, but instead leads to a decrease of potassium SK current suggesting that Ca pump helps repolarize the cell (Figure 1B). 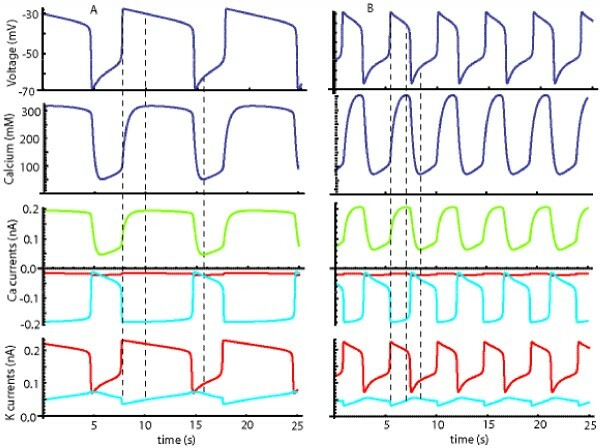 Square waves with nonectrogenic Ca pump (Figure 2A) show that the depolarization is still driven by Ca L-type current whereas the repolarization is mediated by slow potassium current. However, with a partially electrogenic Ca pump (Figure 2B), Ca concentration peaks toward the end of the depolarized plateau supporting our hypotheses that Ca pump could help repolarize the cell. Bifurcation diagrams (not included) also show the interplay between Ca pump and potassium outward currents in membrane repolarization. SOP with nonelectrogenic Ca pump (A) and 15% electrogeneicity (B). Square wave with nonelectrogenic Ca pump (A) and 15% elecrogenicity (B).